Have you ever felt like you were straddling a fence in your life, with one foot dangling on either side? Or like you’ve compromised instead of standing for what’s right? Imagine two choices, two lifestyles, two ways. You know the one that God wants you to walk and yet you feel compelled and lured by the other choice – either because you are personally enticed or maybe your friends, coworkers, or family members lean in that direction. What do you do? Which do you choose? Tonight’s episode of Stranger Things, Trick or Treat, Freak, captures the idea of the “halfway” in several ways. We begin with a conversation between Hopper and Eleven. 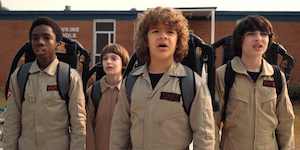 Eleven is isolated and unable to be with her friends (for her own safety), but concocts a plan to remain unseen as a ghost (ironically our four boys are dressed as Ghostbusters). She wants to go trick-or-treating – to be a normal kid. Hopper sympathizes but refuses, offering a “compromise” or as he says a “COM Promise – it’s something that’s kinda in-between. It’s like halfway happy.” El agrees to the compromise, echoing the new definition, “halfway happy” and Hopper promises to return by 5:15 to eat candy and watch scary movies (a promise he doesn’t follow through on). Nancy is another character who has compromised. She has settled for Steve (who at this point seems to be acting nicer than last season), but Nancy feels like he is sweeping Barb’s death under the rug and focusing on “bulls***” (repeated several times) by preferring to wear ‘stupid’ costumes (Risky Business pimp and prostitute – really nice Steve), go to a ‘stupid’ party at Tina’s, and pretending to be ‘stupid’ teenagers. Nancy drinks herself silly, gets splashed on accident by Steve with ‘pure fuel’ (alcohol-infused punch), slurs over her words in a bathroom break-up with Steve and is driven home and tucked in bed by Jonathan. Wow. At least she is not on the fence anymore, but the episode ends with many loose ends regarding Nancy, Steve and Jonathan. We’ll look to future episodes to flesh out what’s really going on in this love triangle. Another halfway compromise that seems to have been made is in Joyce’s decision to date Bob – a really nice guy who was the “geek” in her high school past and is now equally geeky, dressed as Dracula and dancing with her to the Rogers-Parton duet Islands in the Stream. Bob seems to truly love and care for Joyce and her boys, and proposes to move to Maine, to start over again, to help Joyce and her family return to normalcy. He says he could get a job at RadioShack there. But Joyce’s expression tells it all – she sees Bob as naïve, sweet and perhaps a bit clueless. Joyce responds, “This is not a normal family,” and Bob says, “It could be. It could be.” But the audience is left feeling Joyce’s reluctance and growing detachment from Bob. Like, like stuck in the Upside Down? Yeah. Like that. Like one slide’s our world and the other…the other slide is the Upside Down. And. And there was this noise coming from everywhere. And then I saw something. No. It was like this huge shadow in the sky. Only it was alive. And it was coming for me. Is this all real? Or is it like the doctors say, all in your head? I don’t know. Just…just please don’t tell the others, okay? They won’t understand. Yeah. She always did. Sometimes I feel like I still see her. Like she’s still around, but she never is. I don’t know. Sometimes I feel like I’m going crazy. Hey, well, if we’re both going crazy, then we’ll go crazy together, right? So we realize in a mutual confession that both Mike and Will feel caught in between worlds – the world of Hawkins as they knew it before all these “strange things” started happening, the world with El in it, and this post-world trying to regain a sense of normalcy (but our characters are changed by their past). They can’t return to life as it used to be, but they feel stuck like they can’t move forward either. And all the while, this dark shadow hangs over Hawkins (and everyone). While the book of Revelation contains imagery that is so often hard to define and interpret, it is clear in this passage that Jesus doesn’t want us to be lukewarm or to straddle the fence. We can’t be “halfway” about Jesus and our faith in Him. We must have eyes to see the worlds that we find ourselves in, yet to live out lives of integrity as we pursue Christ. Jesus wants us to be refined, pure and holy. And what a comfort to know that He is standing at the door of our hearts, knocking (and it’s not a trick). We must simply hear His voice, open the door and let Him in. All in – there is no halfway. And the end is sure – victory in Jesus. Have you ever compromised? Was it a good thing or a bad thing? Why? How can a compromise be good? How can a compromise be bad? How does Eleven feel stuck? What would you do if you were in her situation? How does Nancy feel stuck? What would you do if you were in her situation? How does Joyce feel stuck? What would you do if you were in her situation? What is it about Mike that makes Will and Eleven trust him so much? How does he show true friendship to both characters? How did Jesus handle people from different worlds (consider the Pharisees and the Samaritans)? Did He compromise in His message or His actions? Should we?